Diamond Estate specializes in branded cut diamonds, such as Royal Asscher, Tycoon, Crisscut, Leo, and others. When selling a diamond to Diamond Estate, you can trust that you are working with an A+ BBB rated diamond buyer — one who has a long track record of helping clients get the most money for their diamonds. We are able to pay you more because we keep our business costs low, operating from a modest office with a small team of experts. Diamond Estate helps clients sell a diamond rings, bracelets, earrings, and necklaces. Diamond Estate has an unrivalled resale network that has been developed over decades. This exclusive network is another factor that allows us to provide higher cash offers than other diamond buyers, such as local jewelry stores, online diamond auctions, pawn shops. When selling a diamond to Diamond Estate, you also can place trust in our friendly and transparent sales process. You will never feel pressured when selling your diamond, and be confident that you are receiving the best possible price. Whether you wish to sell an engagement ring or loose diamond, Diamond Estate will fully explain how much your diamond is worth and how we have arrived at our best cash offer. Discover what thousands of others have experience nationwide: that Diamond Estate is the best way to sell diamonds and diamond jewelry. Contact us today for a free market appraisal and immediate cash offer for your large carat diamond. 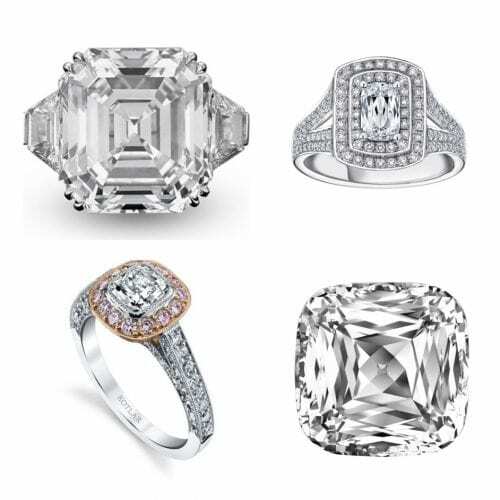 Diamond Estate specializes in helping clients sell large diamond rings set with a center-stone over 3 carats, including brand cut diamonds, such as Kotlar, Crisscut, Royal Asscher, and others. Please see below a sample of the branded cut diamonds we purchase from sellers like you. Kotlar cushion cut diamonds are the signature cut of Harry Kotlar and company, first introduced in 2003. Inspired by the original 19th century cushion cut, or “mine cut,” the basic shape of the Kotlar cushion cut diamond is square with rounded corners. Kotlar re-visioned the classic cut based on an appreciation of the famous Second Star of Africa, a 317.4 carat cushion cut diamond in the British Imperial State Crown. 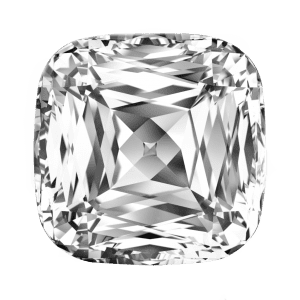 Today’s Kotlar cushion cut diamonds are a testament to the vision of Harry Kotlar’s grandson David Wiener, whose quest to create a diamond with superior brilliance culminated with the Kotlar cushion cut. Fashioned with a unique pattern of 61 facets, this contemporary take on an old world cut uses a specific formula of crown and pavilion angles to maximize the stone’s fire and brilliance, with a fuller silhouette and distinctly feminine lines. Kotlar cushion cut diamonds are fashioned with a unique pattern of 61 facets. Kotlar cushion cut diamonds can range in color from D to K, and from Internally Flawless to SI2 in clarity. Each stone also features a tiny laser inscription on the girdle as a mark of authenticity. Though largely found in wedding and engagement rings, Kotlar cushion cut diamonds are also featured in other fine jewelry. 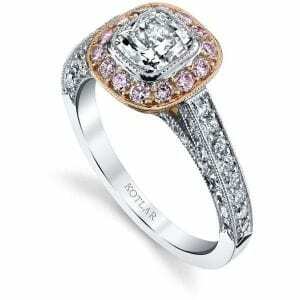 Contact Diamond Estate today to sell your Kotlar cushion cut diamond jewelry. Crisscut diamonds are the brainchild of Christopher Slowinski, the founder of Christopher Designs. Fascinated with applying modern technology to his traditional diamond jewelry training, Christopher found a way to modify traditional cuts with his Crisscut designs. What makes the Crisscut diamonds unique is their extra triangular facets that ‘crisscross’ the stone. The original patented Crisscut diamond shape was a unique variation of the emerald cut, in which extra facets ‘crisscross’ the step cuts of the emerald shape. 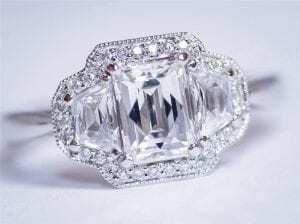 The result is a diamond with 29 more facets than the traditional emerald cut, allowing for more light refraction, with the resulting increase in scintillation, fire, and brilliance. This can also result in a “face up” appearance that can be two grades higher than the diamond’s actual color grade. Crisscut diamonds are available in Asscher, Cushion, Brilliant, and L’Amour shapes. 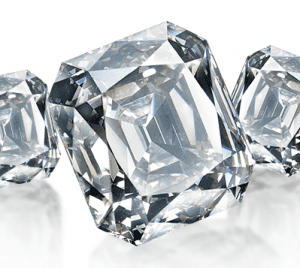 Christopher later turned his new technique to other traditional cuts, and Crisscut diamonds are now available in Asscher, Cushion, Brilliant, and his trademarked L’Amour shape. All use the triangular faceting of the original Crisscut design, with the Brilliant Crisscut boasting a remarkable 109 facets. While appearing round, the Brilliant Crisscut stone actually features twelve straight walls and twelve sides, giving the impression of a delicately scalloped border. The Crisscut method allows for the diamonds to be generally shallower than a traditional cut, so the Crisscut stone will appear larger than a conventionally cut stone of the same carat weight. Crisscut diamonds are also more forgiving in clarity quality, so often a diamond of a lower grade can be used. Even though the Crisscut technique wastes more of the rough diamond, the final cut is much less likely to emphasize inclusions, so lower clarity stones are more likely to appear ‘eye clean’ than those traditionally cut. At Diamond Estate, we always are interested in talking with people who wish to sell a diamond engagement ring and other fine jewelry from Christopher Designs. Contact us today for a free consultation. The Royal Asscher Cut takes its name from Joseph Asscher’s original Asscher Cut, which he perfected in 1902. The original Asscher cut, a highly specific type of square emerald cut, has been a staple, copied both well and poorly, since its introduction. Joseph Asscher’s great grandsons, Edward and Joop Asscher, became fascinated with the idea of enhancing their ancestor’s design in 1999. Using sophisticated computer modeling and simulation, the two consulted with their team of master craftsmen and polishers, and after two years of development, they presented the first Royal Asscher Cut, and were rewarded with a worldwide patent. The Royal Asscher Cut is perfectly symmetrical, with distinct proportions that must fall within very specific parameters. The cut can only be fashioned from an octahedral shaped rough diamond crystal, with only 5% of the world’s rough diamonds meeting the exacting standards. The Royal Asscher cut features 74 facets, versus the 56 facets of the traditional Asscher cut. Once a suitable rough diamond is selected, it is then sawn above the girdle, sacrificing over 15% of the rough stone, but providing for the cut’s exceptionally high crown. This high crown is essential to the finished stone’s ability to disperse color and light. The Royal Asscher Cut’s superior brilliance in comparison to a traditional square-emerald Asscher cut diamond is unmistakable. Technically, the Royal Asscher Cut is complex, and requires a level of skill fewer than 75 master craftsmen possess. In order to draw out the stone’s fire and scintillation, these experts must polish the diamonds to exact specifications — a proprietary process that can take over three months to learn. Large carat Royal Asscher cut diamonds are sometimes sold at auction. To learn why clients often choose to sell large diamonds to Diamond Estate versus an auction, contact our diamond buyers today. The Ashoka cut diamond takes its name from an Indian emperor of the Maurya Dynasty who ruled most of the Indian subcontinent from 269 BC to 232 BC. Once a fierce warrior, Ashoka had a reawakening, coming to believe that the path to enlightenment could only be attained through peace and tranquility. As a result, he encouraged his subjects to practice Buddhism. The story of the original Ashoka diamond fascinated and inspired diamond expert William Goldberg, who painstakingly studied every facet of the ancient stone’s story. He and his team were eventually able to create a modern version inspired by the original Ashoka diamond, and were awarded a United States patent for their efforts. Ashoka cut diamonds are available only through jewelry stores authorized by William Goldberg. 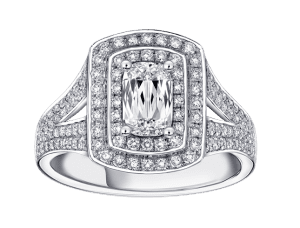 With a rectangular girdle outline and rounded corners, the Ashoka cut is basically a modified cushion cut, and features 62 facets, giving the diamond the appearance of being larger than it actually is. Only very particular rough diamonds can be fashioned into Ashoka cuts. Because of its elongated shape, rough diamonds need to be extraordinarily long in order to be fashioned in this manner, making less than ten percent of all rough diamonds suitable for this cut. The resulting finished diamonds are renowned for their brilliance and overall beauty, and are available only through jewelry stores authorized by the William Goldberg Corporation. The quality of Ashoka cut diamonds can vary from D to K and from flawless to SI2, but the quality of the cut makes them sought after and unique. Although the modern version of the Ashoka cut has been well known for decades, it has enjoyed renewed attention with the engagement of Reese Witherspoon in 2010. 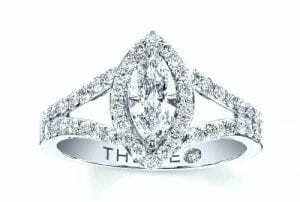 Her 4 carat Ashoka diamond mounted on a pavé set diamond and platinum band created a sensation that brought the legendary cut back into the popular imagination. Because of the rarity of Ashoka cut diamonds (compared to more popular cuts), when selling this diamond you want to be sure to work with a diamond buyer who has a great amount of experience with this diamond — so that you can feel confident in receiving a fair cash offer. Get a free consultation now with Diamond estate. Victorian Cut diamonds might seem to refer to diamonds from the Victorian era, but those diamonds, all cut and faceted by hand, varied greatly from stone to stone in both the size and the shape of the individual facets. Today’s Victorian Cut diamond is the result of the pioneering work of ABA Diamond’s owner Ari Abaev. While working with an antique emerald cut diamond, he was struck by the stone’s particular brilliance, and set out to discover what made that individual diamond special. The Victorian Cut he developed is based largely on what he learned from his exacting analysis of the old diamond. Today’s Victorian Cut diamond is the creation of ABA Diamond’s owner Ari Abaev. Today’s Victorian Cut diamond, which premiered at a Las Vegas trade show in 2002, was heralded as “the victory of art over dimensions.” The classical shape of the contemporary Victorian Cut is octagonal, designed and cut to precise dimensions and ideal proportions. These new stones feature a unique, multi-faceted crown with step cut pavilion and a total of 73 facets. Table sizes for Victorian Cut diamonds range from 58 to 63 percent, and the total depth range is 60 to 64 percent. The proportionally small table of the multifaceted top crown adds to the stone’s brilliance, but the bottom pavilion is also multifaceted and step cut. The mathematically configured dimensions of the bottom pavilion also add to the increase of the stone’s reflective brilliance. The combination of the Victorian Cut diamond’s classical proportions, perfect shape, and the precise measurements and angles of the facets results in a stone that naturally appears even larger than its true proportions. Ready to sell Victorian Cut diamond jewelry? Get started with a free (no obligations) market appraisal. The Tycoon Cut diamond is the brainchild of the two Toros Kejejian cousins, who came to the United States from Lebanon over 30 years ago as their family’s third generation in the jewelry industry. Their highly innovative Tycoon Cut was introduced to the diamond industry in March 2000, at the American Gem Society Conclave in Philadelphia. 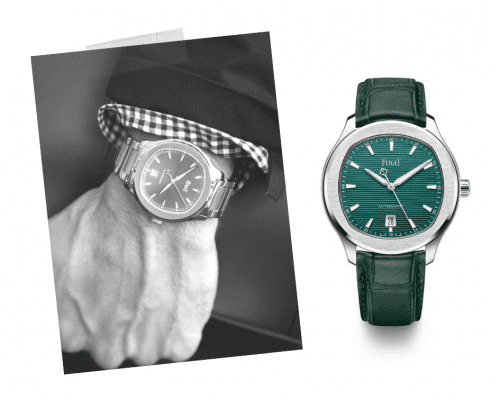 Today, the Tycoon Cut is widely acclaimed for its innovation. The design has been awarded four US patents, and the cousins were awarded the prestigious Gemological Institute of America’s League of Honor Award in 2003. The first Tycoon Cut diamond is on permanent display at the GIA’s museum. The Tycoon Cut’s slogan is “The only diamond with a diamond top”. The Tycoon Cut is essentially a simple design, featuring nine crown facets and twenty step cut pavilion facets, yet it is available in a number of shapes, including Square, Rectangular, Tapered, Trapezoid, and Cut Cornered. It is the unique faceting on the crown that makes the Tycoon Cut instantly identifiable. Though primarily used in diamonds, the Tycoon Cut is also employed in a variety of colored gemstones, including rubies, emeralds, and blue, pink, and yellow sapphires. Every Tycoon Cut diamond of .50 carats or larger carries a laser inscription on its girdle to ensure the stone’s authenticity. Leo Schachter founded his diamond business over half a century ago, and worked for decades perfecting a faceting design that would increase a diamond’s brightness and beauty. The results of his company’s passion have led to the Leo Diamond, a stone specifically designed and handcrafted for maximum brightness. Leo diamonds use a unique, patented faceting arrangement. Round brilliant diamonds generally have 57 facets, but the technique used to create Leo diamonds fashions 66 strategically placed facets in the Leo round diamond, and between 61 and 66 facets in the Leo princess cut. The Leo Diamond’s brilliance can help hide internal flaws that might otherwise be more visible to the naked eye. The precise placement of these facets is key to the stone’s brilliance. When light hits the facets of a diamond, it is refracted and reflected from one facet to another, and finally dispersed through the top of the stone. The amount of light that meets the eye of the beholder is known as the “return of light”. In addition to having exceptional “return of light,” the Leo Diamond’s brilliance can also help hide some internal flaws that might otherwise be more visible to the naked eye. This is also true in princess, marquise, and radiant cut diamonds. When a cutting style is more forgiving, inclusions start to blend into their mirrored environment. This allows consumers the option to sacrifice a higher clarity grade and still get a great looking diamond. Who Buys Diamonds for the Best Prices?